Have you been looking for a compact sedan that can handle all of your daily needs with ease and still provide you with a pleasant ride? If so, pay Largo Honda in Florida City, FL a visit. At our dealership, drivers can discover a large assortment of Hondas in stock including an excellent array of Used Honda Civics. As one of Honda’s top-ranked Honda dealerships, Largo Honda has served Hialeah, Kendall, Homestead, Coral, Gables and Miami, FL for a number of years with great prices on all Hondas. Stop by Largo Honda at 554 NE 1st Ave. and test drive a used Civic today. As a Certified Pre-Owned Honda, every Civic will give you the confidence to use the vehicle on a routine basis. Each Certified Pre-Owned Civic goes through a rigorous checklist before going on sale. Every compact sedan is less than six model years old and has less than 85,000-miles on it. Our set of factory-trained technicians will perform a 150-point inspection on the vehicle to ensure that it’s running at its best. If our specialists find anything that needs to be restored, they use genuine Honda components. Every Civic also comes with a CARFAX Vehicle History Report and a clean title. Besides meeting a strict checklist before going on sale, every Civic comes with a lengthy warranty. Each compact sedan is backed by a 7-yr./100,000-mile powertrain warranty, as well as a Certified Used Car Limited Warranty that lasts for 12-months/12,000-miles while the New Car Warranty is still in effect. For more coverage, drivers have the opportunity to get the available Honda Care Certified Additional Coverage that prolongs the powertrain warranty to 8-yr./120,000-miles. At Largo Honda, we’re known for our ability to get motorists into a pre-owned Civic today. After searching through our vast assortment of Hondas in stock, our amazing finance team will get to work on getting you an incredible rate on a Honda. Even if you have less than stellar credit score, our finance team will work tirelessly to get you an outstanding loan that works for you. Before coming to our dealership, visit our website to get an idea what your credit score is and to fill out a finance application. With our available website and incredible staff, you’ll be driving home in a used Civic in no time. 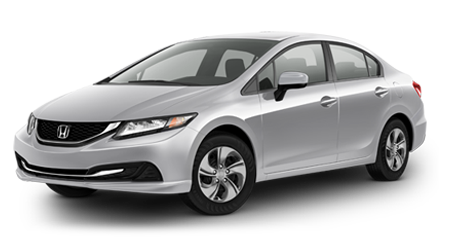 A Pre-Owned Honda Civic has the same versatility, usability and comfortable ride as a new model, but is at an affordable price. Through Honda’s Pre-Owned Car Program, motorists can get into a used Civic today. Come by Largo Honda in Florida City, FL and discover a used Civic today.